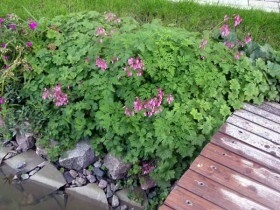 The bleeding heart, reproduction, growing, care, examples of landscape design, photo and video. The bleeding heart in the garden. Pyshnotsvetuschie roses, gladioli and peonies – it's wonderful. All of these plants look quite traditional, their appearance is familiar to every lover of flowers. Why not liven up a familiarity with something original and innovative? This thought probably comes to mind every green thumb. 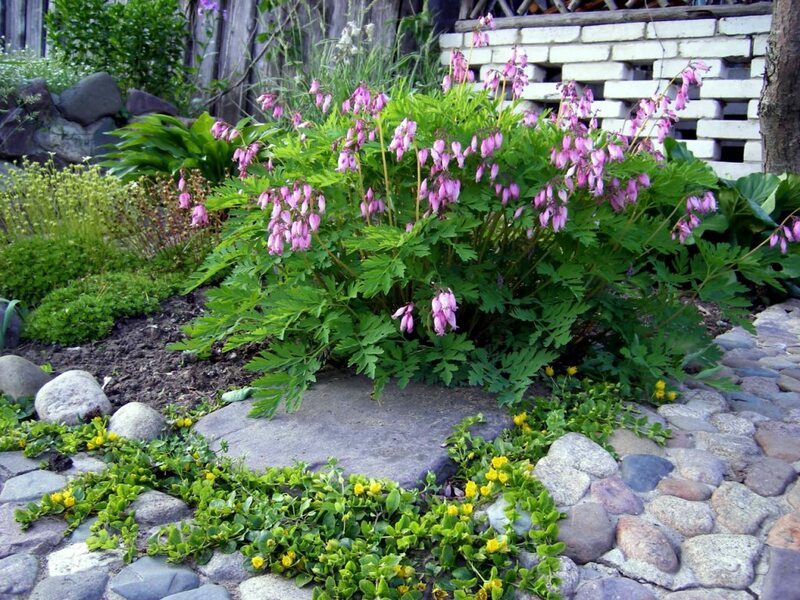 The bleeding heart will bring in the appearance of the site a unique touch and will decorate the garden for its flowers until mid-summer. The Latin name of the plant is used infrequently, people have come up with a more popular and intuitive options: "dusparic", "broken heart", inventive French call the flower "heart Jeanette", practical Germans – "flower heart", residents of Foggy Albion – "lady in bath", other European residents – "locks and keys", "flower-Lira". The birthplace of culture – Japan, in the European part of the continent it was only in the early nineteenth century and immediately won the hearts of the nobles and aristocrats. The sophistication of the bleeding heart immediately began to call the great and superb, exceptional and just beautiful, all these adjectives are established in the names of varieties. The plant may be of different heights, for this reason, it is in the center of the composition, and in the corners or along the curb landing. 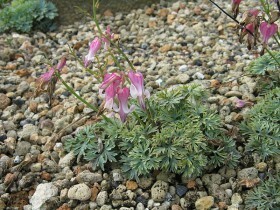 Pink dicentra with blue-green foliage. The plant easily tolerates the hardships of outdoor life, however, the place for landing is better to prepare in the fall. On badly lit side buds bloom worse, but the bleeding heart is ready to grow in the shade of the trees. The selected area should be well dug to a depth of 40 cm, add humus based: 3 kg per square meter of surface. You can make complex fertiliser. After the start of flowering bleeding heart fed three or four times per season. Such care ensures proper development and profuse flowering. After watering or rain, the soil around the bushes should be loosened, to prevent the formation of a dense crust. This should be done carefully: the roots of "broken heart" are very close to the surface. Better to do it through the small garden of the Trident. Requirements to the soil: it should be easy and good to pass air and moisture. Heavy, clay soil can be mixed with peat or river sand. Experienced gardeners do in the winter in the hole "cake" made of reeds or dry straw, alternating it with the ground. There are three ways of reproduction of this interesting plant: seeds, aerial shoots, dividing rhizomes. 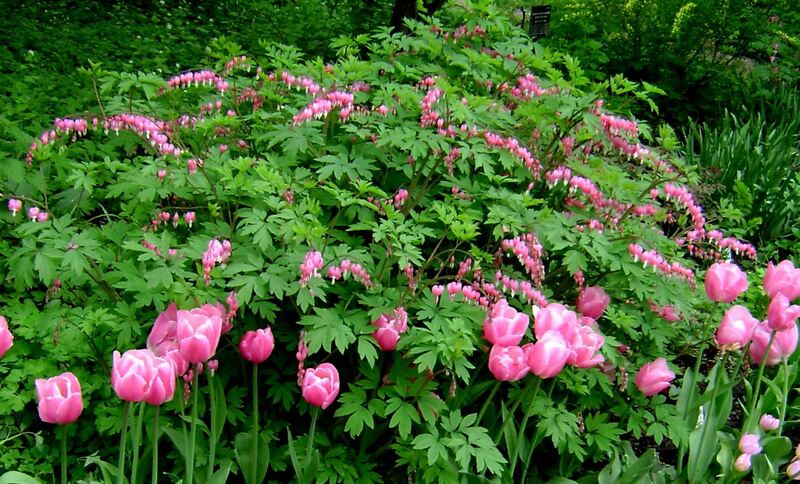 The first of these is the most unreliable and time consuming: the bleeding heart forms a small amount of seeds, and some varieties in temperate latitudes, they do not give at all. The best method of propagation: the division of rhizomes or shoots of separating time. To make the division better plants by the end of summer, when the aerial shoots wither away. 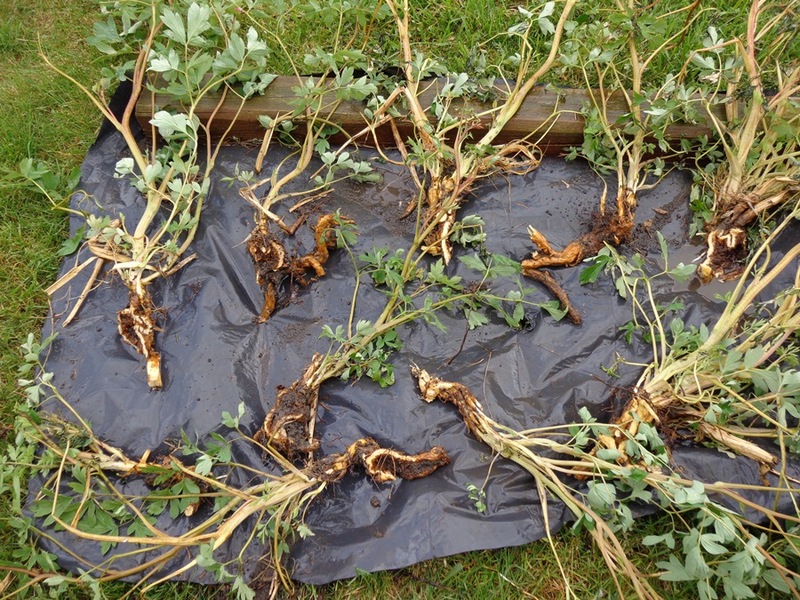 Rhizome break very carefully, then removed from the ground and dried. Sluggish part makes it flexible and less brittle. The root to split, each segment should have three to four buds. Planting material is buried in the ground in partial shade and well watered. In order to prevent diseases slices sprinkled with ash. Rooted shoots are transplanted to a bed, on a constant. The procedure division is made not more often than once in five or six years. The most reliable method of propagation – division of rhizome. The best time to transplant "broken heart" – spring. To choose the moment, when the shoots are not yet "awake" or just started to grow. To dig in the flower bed a small hole in the distance 30 – 40 cm. In every hole to put three or four delenki. To fill the earth, compacted. Pour warm water, it can be warm in the sun. The operation carried out in the spring, you need to rake the soil at the base of the Bush and a sharp knife to cut parts of the plant with "promenade". To hold the cuttings in stimulant during the day, then planted in moist soil and cover with greenhouse film. Roots should appear within a month, and a permanent place sprouts planted only a year. For distillation in August, the rhizomes are dug and planted in pots or vases. The plant should be in a dark and cool place at temperatures 1 – 2 degrees. Rhizomes should not dry out, the bleeding heart watered regularly. In order, to keep the plants "woke up", he put on a light. The plant blooms well in the shade, the sun, but in open areas the buds are "broken heart" before bloom and wither, in the shadow of these processes are slower, but the flowers get bigger and brighter. The bleeding heart in the landscape. 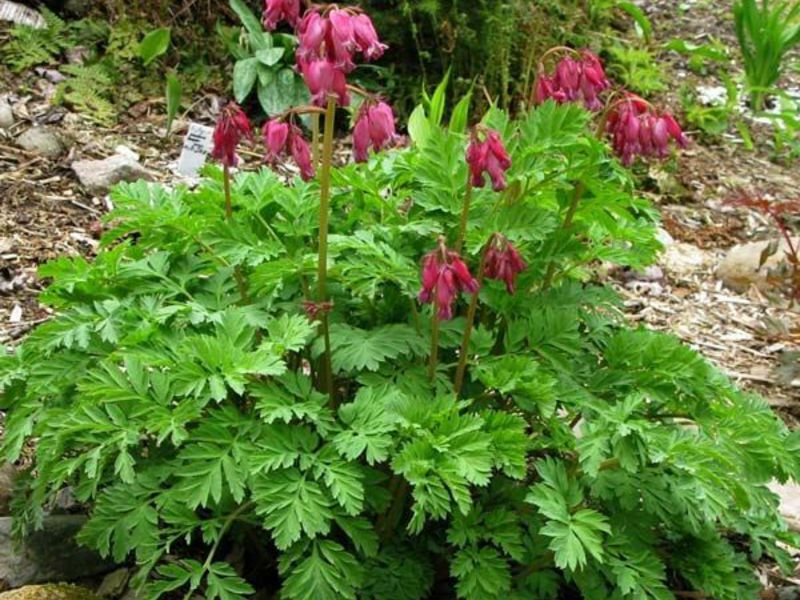 The bleeding heart prefers stony and sandy soils, one of the best places for the location – the slopes along the trails, brick or stone. Under the topsoil layer can be positioned drainage of expanded clay, coarse river sand or gravel. Saturated colours you can get, if you feed the plant in spring superphosphate. Even after flowering is necessary to make the roots of nitrogen fertilizers for proper formation of new kidney. A strong and sudden lowering of temperature may have a negative impact on the plant, it is better to cover the non-woven material. Faded brush the best time to remove: the flowering period of other branches will last. The aerial part is removed by arrival of autumn, hemp – not above 5 cm. Waterlogged soil can promote rot, for planting is best to choose a raised place or make mounds artificially, equip grooves. 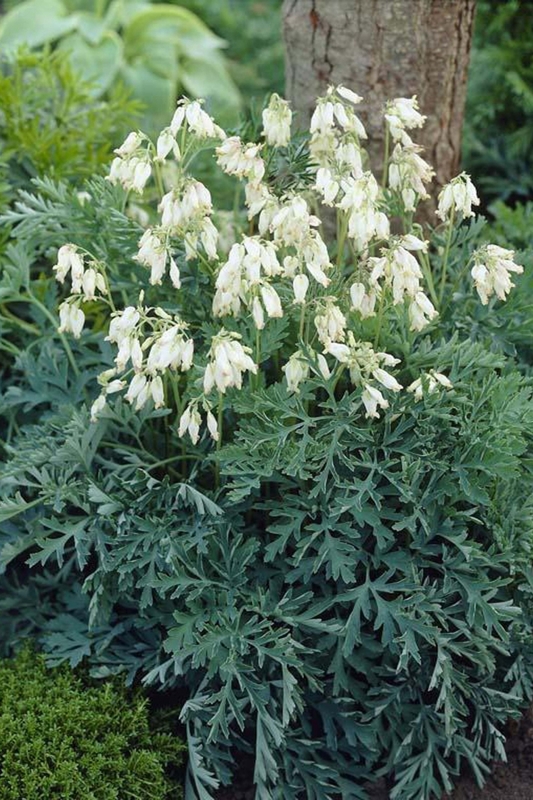 In hot weather watering is carried out more frequently, to protect from the sun using humus or peat: it spread a dense layer at the base of dicentra. 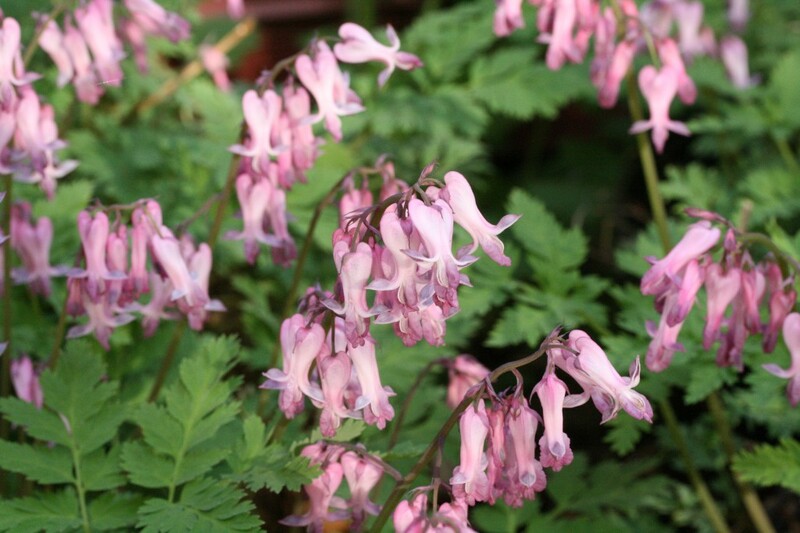 It must be remembered: the roots of dicentra contain toxic substances, work with them in gloves. Of all the broken hearts it is the largest. Adult specimen of the plant looks like a lush, fishnet, thickly strewn with flowers a full Bush. The most common color is pink, but there are plants with white flowers, which are shorter and less decorative. The bleeding heart is gorgeous. Miniature shrub, height – to 30 cm. 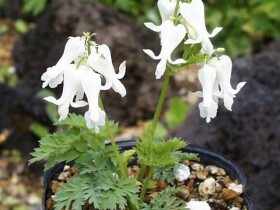 Flowers – small, graceful, pale white or bright purple. Flowering period – from early spring to late summer. The leaves of some varieties are covered with silvery down. Best use in landscape design – design of rock gardens and borders. This kind of gives dicentra seeds. The bleeding heart is beautiful, the variety “Aurora”. Small stature, to 25 cm, foliage is bluish – green, resembles the shape of a fern. 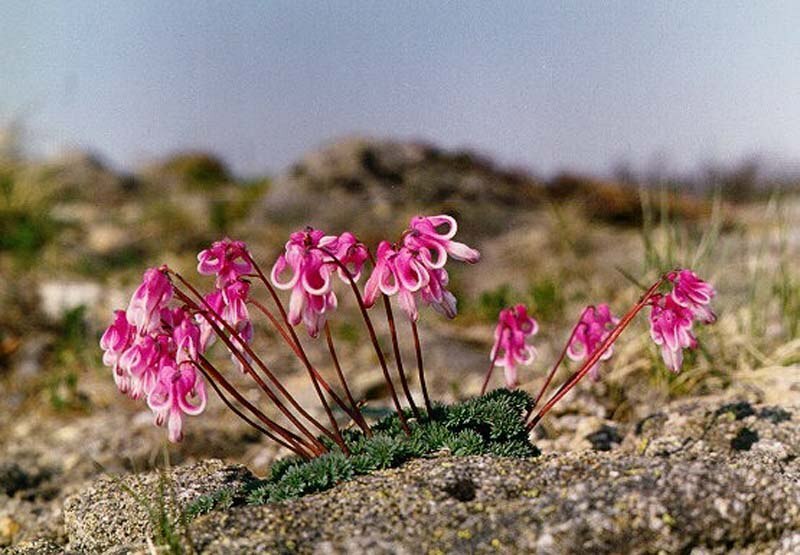 Blossoms – pink, white, purple, not so much, as in other types of, the plant lends itself to winter forcing. 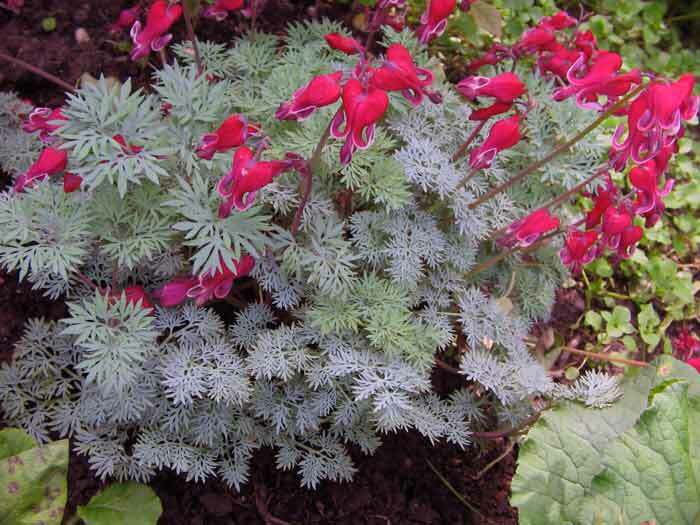 The bleeding heart is an excellent ideal for decorative rockeries and Alpine, pine plantations. The bleeding heart is an excellent. The result of the work of breeders, annual, whose homeland are the Himalayas. 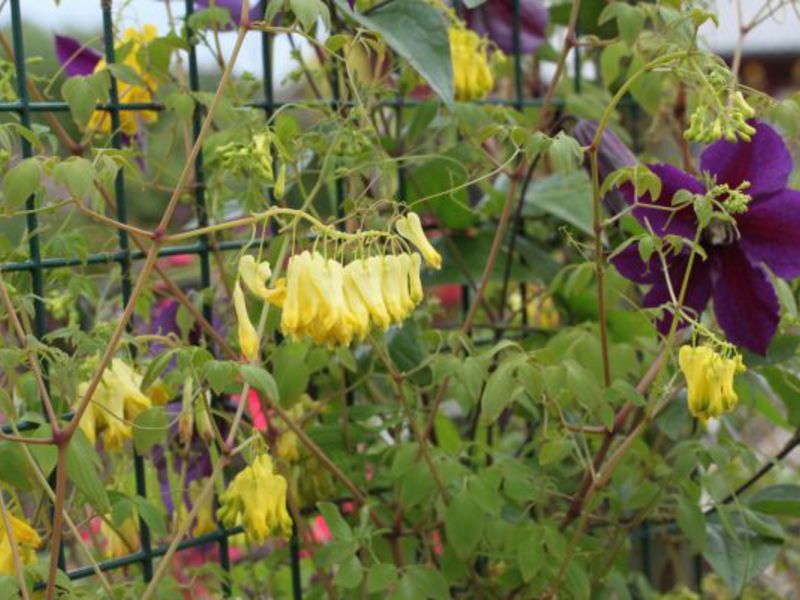 It's not Bush, a vine length of two meters, blooms yellow buds. This type is more difficult to grow, it requires a warm climate and absolutely not tolerate cold weather. 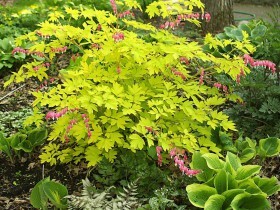 The bleeding heart twining, the variety is “Golden tears”. Mini-bushes to 20 cm in height, roots – short, flowers – large, but rare, red, pink or white. Blossoms from July to September. Easily tolerate cold weather, feels good in the temperate latitudes. Loves gravel and stones, sand. 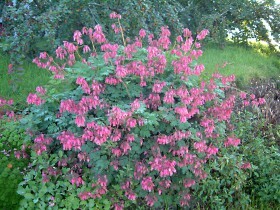 The bleeding heart bregagno are planted on slopes and embankments. A broken heart is a universal flower, which is equally good for a group, and for single landings. Low grade literally created for the decoration of the lawns, rockeries and rock gardens, evergreen shrubs, high – to create tiered flower beds near the house. The bleeding heart is practically not affected by diseases, resistant to pests, an exception may be aphids, Cicada, ring spot. For protection of plants from pests it is necessary to timely weed. Brodyazhnaya bleeding heart on the rocks. 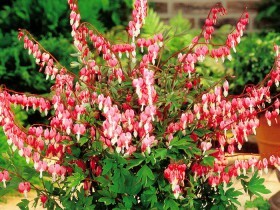 Brodyazhnaya bleeding heart, the variety “Alba”. The bleeding heart, the sort of “Hard gold”. The bleeding heart is beautiful, the sort of “Formosa Luxuriant”. All content on this site SamDizajner.ru written specifically for Simdesigner, copying 1 in 1 strictly prohibited. Reprint, full or partial rewriting of the article “The bleeding heart is the irregularity of the shape”, possible, only when you specify the full, active link to the source.